Schedule changes due to inclement weather or Holidays are posted on Facebook. Bring balance to your life and your loved ones. Learn the basic principles of the Bach Flower Remedies and use them to face daily life situations. This 1-day course will be taught by Debi Testa, BFRP, BCPP, CYT. Learn more. Curious about Yoga, however you have been too intimidated to try a class? Are your hips, hamstrings, and shoulders stiff or tight? This semi-private class helps men relieve stress and pain, increase range of motion, and decrease chance of injury. Leave class feeling more aligned, balanced, and calm yet energized. Are you working with an injury, going through a more stressful period in your life, type-A, or just plain tired? This class is for you. You will unwind, relax, and receive. 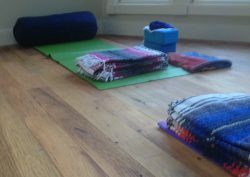 In this class the body is fully supported with props creating deeper releases. The focus is on being rather than doing. This class is offered once a month.